MALAKAL, South Sudan (CNS) — When the shooting stops, it’s eerily silent in Malakal. The quarter million people who once lived here have dispersed to other cities or countries, or to the nearby U.N. base where they live behind barbed wire and heavily armed blue-helmeted soldiers, or to simply living in the bush, trying to stay out of the path of the several armed groups ravaging the countryside. Yet amid the silence a small voice once again speaks. The “Voice of Love” radio station is part of the Catholic Radio Network, a group of feisty communicators who have braved everything from intolerant officials to outright war to keep hope alive in the world’s newest nation. The Malakal station — which is also heard in the war-torn Nuba Mountains of Sudan — stays on the air because Italian Comboni Sister Elena Balatti refuses to let it be quieted. Sister Balatti has lived in South Sudan for 14 years. She is well acquainted with the country’s ethnic tensions, and the radio station, housed in one of Malakal’s parish compounds, modeled the diverse staffing and programming that celebrated all the ethnic groups in the area, although it broadcast almost entirely in Arabic and English, what amount to neutral languages in the tense environment. After fighting spread to Malakal in December 2013, the town changed hands six times in three months. 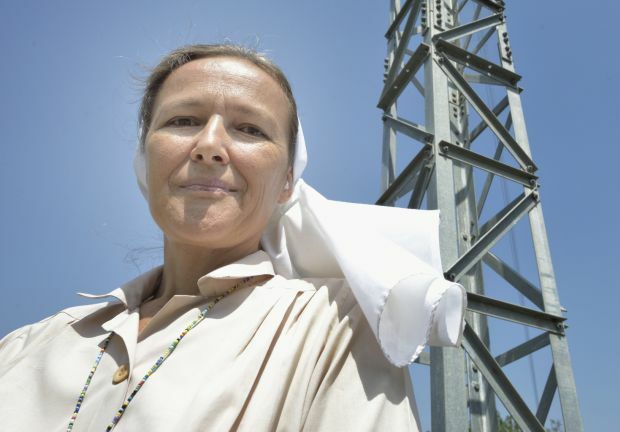 During that time, Sister Balatti focused on keeping the radio on the air, and when that wasn’t possible helped to minister to the needs of thousands of people who sought refuge in the town’s Catholic cathedral. “We tried to operate the radio in between one period of fighting and another. We couldn’t work when the opposition forces were occupying the town, because the shooting was continuous and I couldn’t guarantee the security of our staff. But whenever we had a period of calm, we’d reopen the station. Because the silence of a voice that people were accustomed to hearing was, by itself, a negative signal that increased the despair of the people,” she said. Sister Balatti said both the South Sudan army and the main rebel group respected the church premises in Malakal, which were filled with refugees. At one time, she says, some 6,500 people were crowded into the cathedral compound. Yet when the so-called White Army captured the city Feb. 18, 2014, she knew they were in for trouble. Aligned with the main rebel group, the White Army is a ragtag collection of some 20,000 Nuer youth, many of them illiterate cattle herders. The White Army has been responsible for some of the worst ethnic attacks, both in the previous civil wars as well as during the current conflict. They get their name from white ash — from burned cattle dung — with which they cover themselves. When word came that the White Army was approaching Malakal, Sister Balatti sent the station’s staff home. The vicar general of the diocese, Father Angelo Mojwok, told some 1500 people still sheltered in the cathedral compound that they should leave for their own safety. As government forces pulled out, Sister Balatti said a great silence engulfed the city. Soon three of the militia members jumped the gate of the church compound with their guns. What followed was a day of horror, as the militias looted the compound and repeatedly threatened the sisters and others inside the compound. Sister Balatti said they were saved by the presence of some Nuer in the cathedral who argued to spare the lives of the sisters and others inside the church. Convinced their fate was about to change for the worse, early the next morning Sister Balatti and many of the others snuck out of the compound and walked to a Presbyterian church, which in general has better relations with the communities where the White Army originates. But even the pastor there had a difficult time convincing the militias not to kill her and the others. Finally the militias agreed to let them go in a vehicle to the U.N. base. “With the other two sisters and as many women as we could fit in, we went to the base. It was a terrible. There were bodies everywhere. The town was burning. The looting was continuing,” Sister Balatti said. When they approached the U.N. base, they were met by thousands of people streaming out of the civilian protection camp there, evidently Nuer people who felt safer with the White Army presence and were returning to their villages. “It was an apocalyptic scenario with the town burning, the shooting and killing and looting, bodies here and there, and thousands of people with their poor belongings marching out and starting their long journey back home,” she said. The sisters were ordered by their superiors to leave immediately, but no U.N. evacuation flights could leave for several days. And then, Sister Balatti said, the woman with the paralyzed mother approached her to say that her mother was still in the church compound in the city. Sister Balatti convinced the U.N. to divert a convoy of tanks and armored personnel carriers to the compound to retrieve the women who remained behind. That done, she finally flew out to Juba, capital of South Sudan. Sister Balatti returned in September, but new fighting again drove her out. In October she finally returned and started putting the station back together. The 72-meter broadcast tower had been hit by rockets and had to be repaired. Like everything else, the transmitter had been looted, yet Sister Balatti found it in the local market, bought it back and had it repaired. In January, the station started broadcasting again, though with a limited schedule, and when fighting resumes, as it did in the city in April, it goes off the air for a few days until things calm down. When staffers do broadcast, it’s mostly music and programs focused on peace. “We choose songs of love and peace, music in the languages of this area, convincing people that it’s possible to live together without the killing and violence,” said Adan Christopher, a staff member. For now, though, local news is off the air. “We’re in an area controlled by the government military. In such a situation, we can’t have news that goes against the view of the government, so at the moment we completely avoid local news. Yet we do try to be a voice that still speaks a bit, if only for a few hours a day, without increasing the fire that’s already there,” Sister Balatti said.